“No need to concern yourself over the past; you cannot change it, nor can I. Let’s just try to do the best we can from here on out. I know for myself, I always try to get the whole truth about things before I make a decision. Yes, I actually do what I teach others to do,” I explained. John continued, “When we first met, I wanted to get rid of the policy Jane’s parents purchased for her. I am so glad I listened to my mother-in-law and came to speak to you. You showed us how to get out of credit card debt in the most efficient way. But I also expressed a desire to purchase a home eventually. Well, we’ve been saving money; in fact, we have saved $25,000 to use as a down payment and have been looking at a house over on Maple Street. We filled out paperwork to get a 15-year mortgage, but we wanted to get your opinion,” John said. “Well, the banker says the 15-year mortgage is better because we get our house paid off sooner and there are fewer costs to the mortgage,” Jane said. “Is getting your house paid for as soon as possible one of your goals?” I said looking at Jane. “Yes, it is. As John’s parents got close to the end of their mortgage, his dad lost his job and they lost their home. It was rather traumatic for John and he does not want to go through that again, nor does he want me to ever experience it,” Jane said sympathetically. Opening my ‘loan analysis’ calculator, I first input their numbers on the left side of the calculator and called that loan 15-year mortgage. I pointed to the screen and asked if the calculator had come up with the same payment they were shown at the bank. “I just love working with you two. You are intelligent, honest, and don’t miss much.” I complimented John. “I will discuss the PMI in a little while, but for now let’s focus just on the loan.” I then entered the same loan amount and interest rate for a 30-year mortgage. I also pulled up the comparisons between the two as a starting point for a discussion. “Good. Let’s put a fine point on this issue. If we take the total payments using the 15-year mortgage – $299,574 – and subtract the original balance of the loan, we end up with $74,574. Doing the same with the 30-year mortgage we come up with $161,706 ($386,706-$225,000). 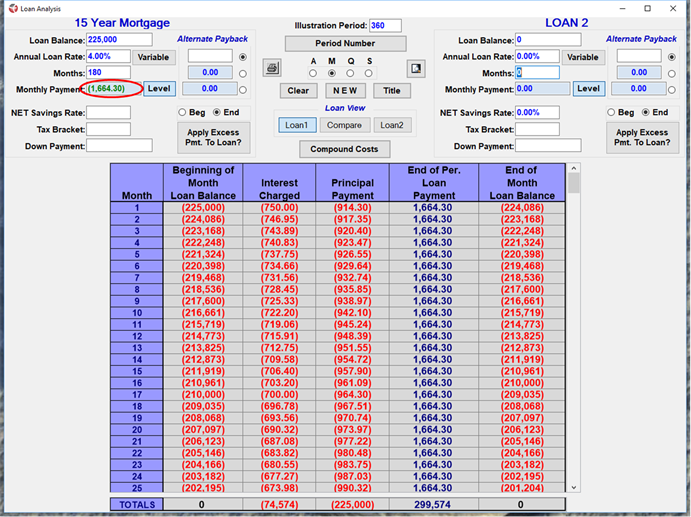 With this simple calculation we are able to say the 15-year mortgage has fewer interest payments, right? However, can we comfortably say the 15-year mortgage costs less than a 30-year mortgage?” I asked. “Jane, you are learning quickly. With this simple calculation, all we can really say is the 15-year mortgage requires us to pay less interest. But one of the big problems with this simple calculation is the whole truth is being ignored. For starters, this simple comparison is comparing a 15-year mortgage over 15 years to a 30-year mortgage over 30 years. Is that really an equitable comparison? And, could that comparison obscure some potentially detrimental information?” I asked. “No, now that you point that out, it is not equitable. To answer your second question, yes I would imagine there are issues that might cause the total costs of the two mortgages to change,” John answered. “Yes, John,” I agreed. “You should realize the vast majority of Americans look at this comparison and say the 15-year mortgage costs less, so therefore, I should use that mortgage. Please, please notice my careful choice of words. I have talked to you about interest expense or interest payments, but not cost. Most people equate the two words. Although interest payments are costs to the mortgage, they are not the TOTAL cost of a mortgage. Let me explain it a different way. “Most people would say the cheaper of the two mortgages is the 15-year mortgage, right? But considering interest payments, what would really be the cheapest way to purchase the house?” I asked. Both John and Jane looked at each other and were silent for a while. “Exactly,” I said. “If you took the cash out of your current assets and paid for the house, you would have zero interest payments. That is absolutely true. However, no consider this: what would be the cost paying cash over 30 years?” I quickly called up a future value calculator and input $225,000 earning 4% for 30 years. “Now assuming I could make 4% on my money for those 30 years, how much have I missed out on in 30 years? “Yes, it is. Do you think you would be happy if you realized you passed up that much money because you thought the cheapest interest payment ‘mortgage’ was to pay cash for your house? Before you answer, what else needs to be considered? Didn’t you free up a monthly mortgage payment? 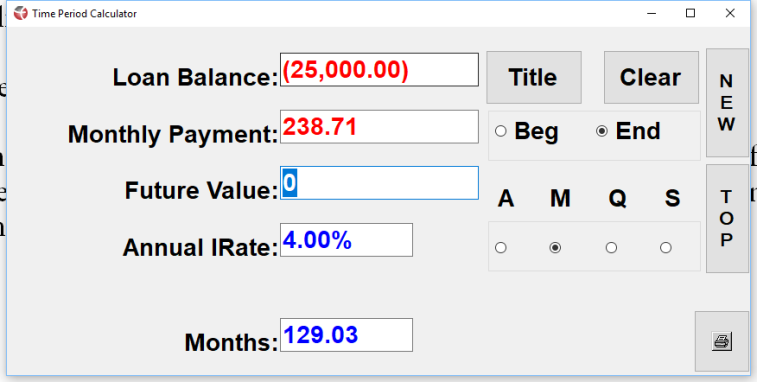 How much would you have after 30 years if you diligently put $1,074.18 – the same amount you would have paid the bank with the 30-year mortgage – into an account earning 4%?” I asked pointing to a new calculator. “The same number?” Jane asked. “I know that is a little puzzling, but yes, the same number. If you took $225,000 out of your assets and purchased the ‘least interest payment mortgage’, i.e. paid cash, and then put the 30-year mortgage payment into an account earning 4%, you would end up with $745,534 in that account and own your house outright. On the other hand, if you purchased the ‘maximum interest payment mortgage’, i.e. the 30-year mortgage, and left your money in your account, after 30 years, you would have exactly the same amount of money ($745,534) and you would own the house. Now comes a very important question: “When comparing paying cash to a 30-year mortgage over 30 years, which of these two methods ‘costs ‘ you the most? The ‘least interest payment mortgage’ or the ‘maximum interest payment mortgage’?” I asked and waited for them to think it through. “Um, there is no difference in cost between the two. 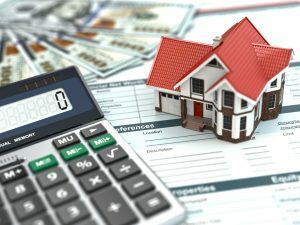 So it must also be true that there is no difference in cost between a 15-year mortgage and a 30-year mortgage either when you look at over a 30-year timeframe,” John mused. “Spot on John,” I said. “Remember, the 30-year mortgage had a total interest charge of $161,706. When the interest rates are exactly the same, there is no difference in cost when comparing the three different mortgages. But, and that is important BUT, there is a huge difference between the three when we take into consideration other factors, or…” motioning them to say it with me, “the whole truth,” we said in unison. “For a few minutes let’s analyze the three from a safety and security point of view. Jane, you told me John’s dad lost his job and was unable to make the monthly mortgage payments which resulted in the family losing their home. We do not want that to happen. With which of the three methods would we be the most likely to lose the house if we could not make the payments?” I asked. “The 15-year mortgage has the highest monthly payment requirement, so that would be the hardest one to keep going in the case of job loss or something similar,” John said. “So I suppose from a safety and security point of view, paying cash is the safest. But we don’t have $225,000 to pay cash.” John frowned. “Neither does most of America, so what is the next best thing?” I asked. “Well, the next best would be to have the smallest monthly payment,” John responded. “But you have been considering the 15-year mortgage with a payment of $1,664.30 a month -” I was saying when John cut me off. “Oh yeah, I see what you are saying, get a 30-year mortgage but pay the $1,664.30 every month, then if something happens we would only need to pay $1,074.18,” John said with a smile. “Can you see why the 30-year mortgage might be a better choice at this point?” I asked. “There is still more to consider; let’s now talk about these three options in light of taxes,” I suggested. “The reason it’s more expensive is that with the 30-year mortgage you get more tax deductions,” I answered. “Well, the lower interest rates do make a difference, but the 30-year mortgage still appears to be cheaper by about $3,400,” Jane responded. “Mortgages are a rare case when, in a sense, inflation is on your side. You see, with each passing year, you are paying with dollars that are decreasing in value. Put another way, each year the payment of a monthly mortgage becomes easier and easier because it’s a fixed amount. In theory, our income is increasing which means the mortgage payment is a lesser part of your total income,” I explained. 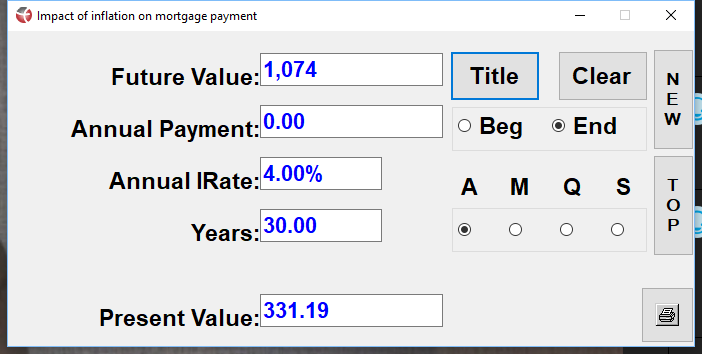 “Using a future value calculator I want to show you what your mortgage payment will feel like in 30 years.” I started the calculator, and input the numbers for them to see. “Now, we are going to circle back to an issue you brought up before John, private mortgage insurance. In order for you to avoid paying the PMI, you would need to put $50,000 down on the house on Maple Street, correct?” I asked. “Yes, but we do not have that much money,” John confirmed. “Do you remember what we talked about in our first meeting John?” I asked. “In case you have forgotten, by looking at things in a ‘big picture’ frame of mind you were able to refinance your debt and get that paid off in about five years. How have you done with that plan?” I asked, knowing the answer. “Yes, I remember. It was a real eye-opening meeting for me. I am proud to report that we have followed the plan pretty close to how it was originally laid out. We have had a few hiccups along the way, but for the most part, we are on track. We were supposed to have the debt totally paid off in 62 months but it is going to end up taking 68 months. We will have that debt paid off in 5 more months,” John reported. “Great. I am so happy to hear you say that, but probably not as happy are you are being able to say it.” I nodded to both of them. “The best part is that lousy whole life policy Jane’s parents purchased for Jane now has more than $52,000 thousand dollars in cash value, just waiting for you to use for a great opportunity. 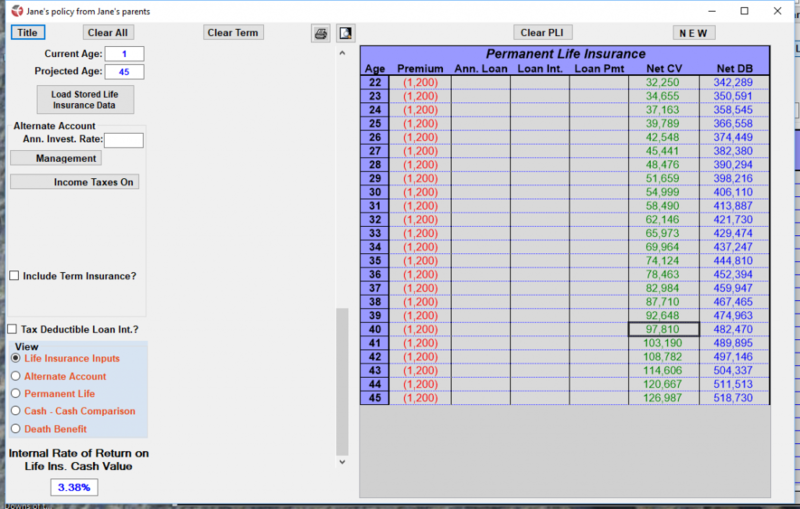 What if you borrowed enough money against your policy so you can avoid paying PMI?” I suggested. “You need 20% down on the house on Maple to avoid paying PMI. 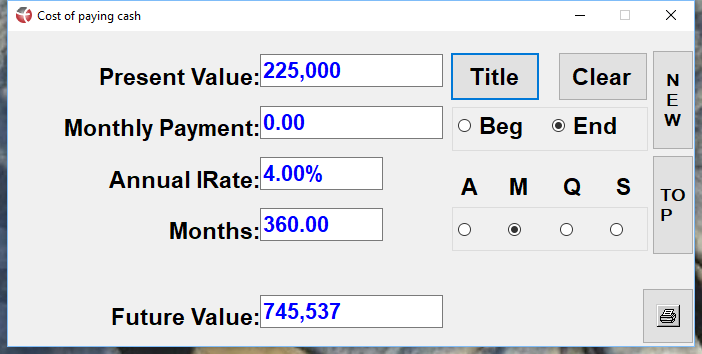 Looking again at our calculator, that would mean your total loan amount would be $250,000. 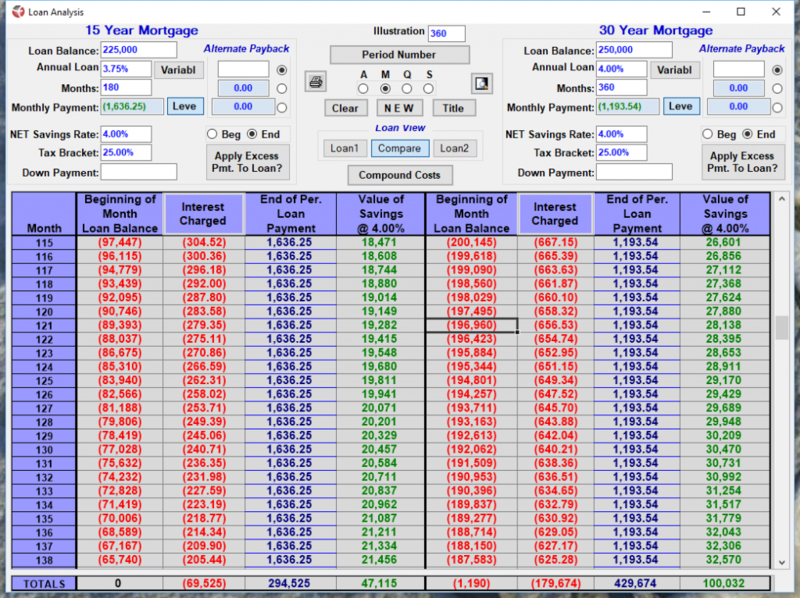 Can you see what your monthly loan payment would be?” I asked as I pointed to my screen. “Yes, that is correct you would have two loans, I am just combining them here. You will have a $200,000 loan from the bank on the new house. You will also have a loan for $50,000 against your policy cash values. This also means you will have two payments to make each month. You will write a check for $954.83 to the bank on the $200,000 mortgage, and one for $238.71 to the insurance company. Going this route will save you a ton of money that you would have otherwise paid for private mortgage insurance. 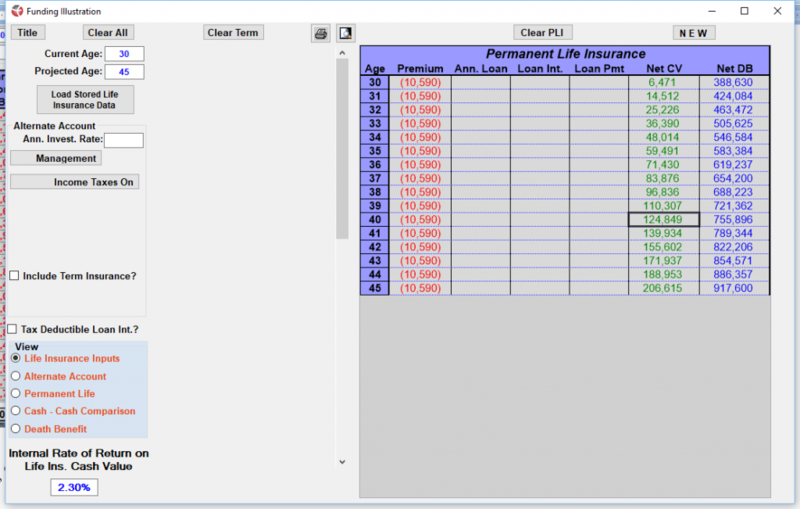 Well, let’s calculate just how much PMI would cost you over time. The first year the PMI would cost you $3,937.50 ($225,000 x 0.0175). Then each year for 14 additional years, you would pay $225,000 x 0.0045 or $1,012.50 per year. Making the grand total $3,937.50 + ($1,012.50 x 14) = $18,112.50. Additionally, the $1,012.50 (paid in monthly payments of $84.38), would be eliminated. “When you came into the office today you were thinking of a 15-year mortgage at 3.75% which would require a monthly mortgage payment of $1,636.25 and a PMI charge of $84.38 per month, or a total of $1,720.63. 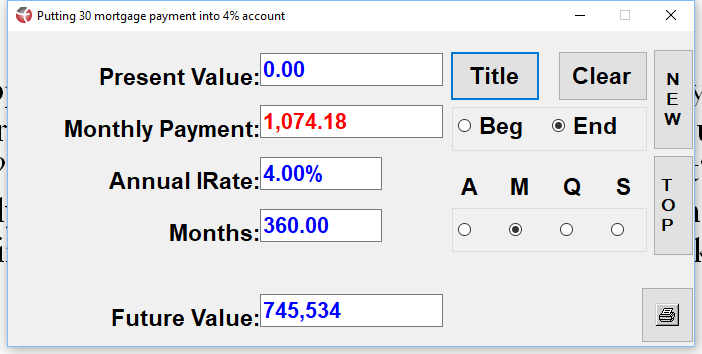 May I propose that you continue to allocate the same amount each month to pay off your home? The first two portions of the $1,720.63 are being paid to the bank and the insurance company leaving you $527.09 per month. Are you following my calculations?” I asked. With a pleased look on his face, John said, “Yes, yes I am. This is great. Please keep going. Oh, wait a minute I have a question. What about the $25,000 in cash we have saved up for the down payment? What are we going to do with that since we are borrowing $50,000 against Jane’s policy?” John asked. “Wasn’t that fun to ask me what you are going to do with $25,000 in cash you have saved up?” I grinned at John. “Now that you say that, yes that felt good,” John replied winking at Jane. “Good question. Before I answer, let me ask you both a question. Before today, how were you looking at your $25,000 down payment? Was that just money lost? Or were you planning to get that back?” I quizzed them. “It is just a down payment. Nothing more, nothing less. We have to have it to buy a house,” John said. “I have said this a number of times, but it’s very important you understand this fundamental principle – it is critical to your financial prosperity: You finance everything you buy,” I said emphasizing the last part. “You are – or were – going to be ‘financing’ that down payment whether you realized it or not. But you had not considered how you were going to recoup the value of that $25,000. Even though it is a cash down payment, YOU are financing it. “That is a long time,” Jane said. “Last week you both filled out applications for a $3,000 per year policy. Did you both reduce your qualified plan contributions to $1,000?” I inquired. “The very next day!” Jane said. I chuckled at Jane’s enthusiasm. “Here you are a week later, and if you choose to follow what I have proposed, you will have an additional $525.09 available each month. That is $6,300 more available to you every year. What if we modified your applications and made them each for $6,150 each?” I asked. “I don’t see why not,” John said. “But what about the $370 per month we will have available once the credit card debt is gone? If I remember correctly, we’re planning to purchase a policy on me with that money. Could we increase my policy from $6,150 to…” John used the calculator on his phone to multiply $370 by 12 and add it to $6,150. “… $10,590?” John asked. “John, if you twist my arm I might be convinced that would be a good idea,” I replied as seriously as I could. Both John and Jane laughed. “Now you are thinking about going with a 30-year mortgage. 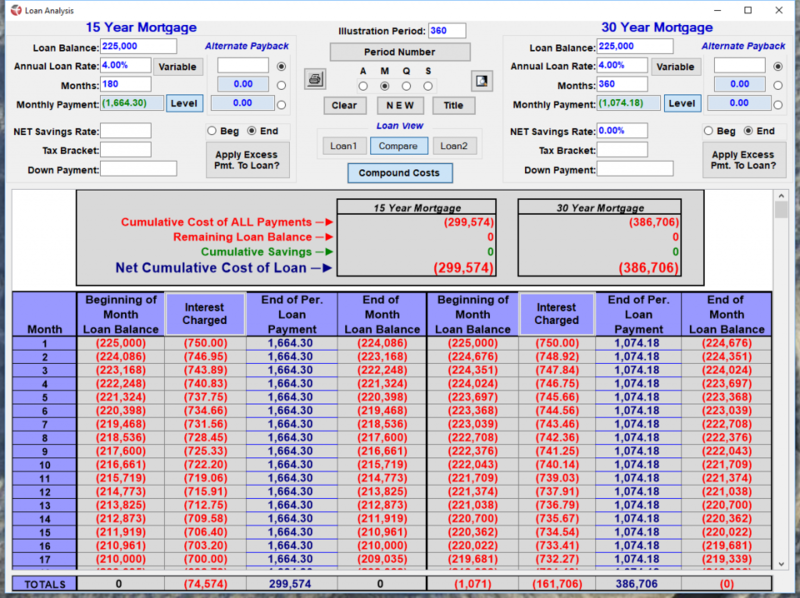 You are thinking that is the best mortgage for you because the total costs are the least. The risk of losing your home due to economic trouble is less. You will get the best tax advantages with the 30-year mortgage. But don’t you want to have your house paid off?” I asked them. “Yes, we do,” John said. “We will still owe $196,960.00,” Jane said. “Please write that number down,” I instructed them. “Remember I showed you it would take 130 months to pay off the $50,000 loan for your 20% down payment you are going to take against this same policy. So the number will not be quite $97,000 -” I was saying. Smiling, “Right. So add $97,000 to the number I had you write down. What do you get as a total?” I asked. “Sooner than that,” Jane said. “I am also getting a policy for $6,150 a year remember,” looking at me. “I want to address something John just said. Will you really be paying the house off? Or will you be in a position to refinance your house?” I asked. “We finance everything we buy,” John said. “Yes, let’s do that.” Both John and Jane said together.